Profiling is a complex topic and I am by no means an expert. To get a basic understanding please read our simple introduction in our handbook. If you don't have proper profiles printing can become guesswork and in many cases you might not even know how far off you are from optimal results. Later if you see better results you might hardly understand the pleasure with your first prints. Alain Briot made the same experience while learning how to use his Epson 9600 printer (read about profiling in his diary). Eye-One with Eye-One Match by GretagMacbeth can profile monitors, scanners and printers. This solution is not cheap by any means (about $3200) but still it is the entry level solution from GretagMacbeth. Their business is color management. There are many companies who pay even $10,000 for high-end color management solutions to get rid of guesswork in the pre-press steps. Part of this price is the measurement hardware. The Eye-one unit is a very modern and capable spectrophotometer. Without such a device precise color measurement is not possible. GretagMacbeth's Spectrolino measurement device is a high-end standard in the graphics industry. This review will briefly cover the monitor profiling, skip the scanner features and then concentrate on the printer profiling. One thing is certain the Eye-One solution is very easy to use. Monitor profiling is key as you want to get a pretty good preview on your screen about the possible result on the printer. 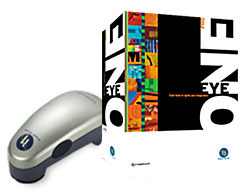 Eye-One allows the profiling of LCD and CRT monitors. The process only differs in the use of different adapters for the screen. The software guides you through all the necessary steps. After that Eye-One measures the monitor and creates the profile. As we work on Windows Eye-One then defines this profile as the system default. From this moment Photoshop is ready to use the new monitor profile (needs restart though). Of course Eye-One works on Macs but we don't have experience so far with Macs (Any one sponsoring a Mac + software for our magazine?). We profiled one CRT and 3 LCD monitors. Only our very new Sony S81 provided some trouble (GretagMacbeth is investigating this issue). On the other side, we were able to profile our Samsung 770 LCD monitor where other products failed. We use LCDs for our work not because this is a better solution, but to save our eyesight. Our main interest into the Eye-One Match product was to profile printers. For our Epson 2000P printer we experienced that the right profile can change your whole printing experience. Don't just think in terms of color, a good profile also influences the contrast: There can be better rendering of shadow details. We would like to point again to Alain Briot's "Epson 9600 diary". You need a different profile for every driver, paper, ink, printer setting (DPI, ink limits) combination. Initially we got some quite good results with the Eye-One unit but since we now use the UV unit we get the best results ever (is also a result of the new ImagePrint RIP we use). The brand new Eye-One UV unit helps to avoid wrong measurements due to brighteners in the paper and fluorescent components in the pigmented inks. It seams to us clear now that you need the UV unit if you are working with the Epson 7500 printer. The benefit of the UV unit is for some not clear at this moment and GretagMacbeth will provide improved software (in early August) for the Eye-One which addresses improvements with Epson printers. 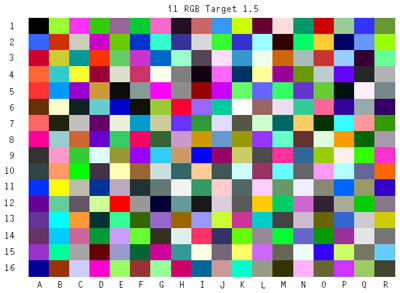 The first step in creating a profile is to print a target (we use the RGB target for the Epson 7500) with all color management off(!) in Photoshop. If you use the Epson drivers you select the right or closest matching paper and turn all color adjustments off. With any RIP you have to follow the instructions of the RIP manufacturer (Profiling with the ImagePrint RIP is simple too). Selecting the right paper setting in the driver can be very tricky as sometimes the Epson drivers do not allow higher DPI with certain papers. We always print with the driver set to 1440 and in doubt we use the setting for "Luster" paper. Remember all settings on the printer have to be the same once you use the generated profiles later. We try to code as much as possible information into the profile name (paper, driver, dpi, inks, ,,,). Very positive is the fact that the Eye-One target only needs one letter sized sheet of paper. Once you have printed the target and also ensured that the print is dry you can create the profile with Eye-One Match. All you have to do is to measure the 288 patches in the right order. Devices like the Spectrolino allow a fully automated process of this measurement. But also the designers of the Eye-One wanted to make your life easier. You can measure in so called strip mode. So far we had only trouble with one target print (printed on pretty yellow water color paper). Once you have read all 16 strips (takes less than 2 minutes) Eye-One Match creates a profile for you. It can also happen at this step that the profile generation fails because the data were not good enough. We had this happened once but re-reading the strips solved the issue. We use non standard papers and even canvas. The Eye-One with Eye-One Match solution provides us with excellent profiles and with much better prints. Eye-One Match provides an easy to use high-quality profiling solution. If quality is your goal you need profiles of this caliber. We will keep (buy) Eye-One Match. But we see also that this might not be an option for every one. We offer our readers to share our cost and get quality profiles. We won't do any magic and just run targets you print through our device. You might also try other professional services who might be more experienced in profiling. We also want to limit our service to Epson Printers as we know these machines (all exceptions on your own risk). Alain Briot's got good results with our profiles on his Epson 9600 printer (read about profiling in his diary). Profiling Service now in beta test!